Alex Bell from Portland Education working with Cornell Sailing Events and Barbados Tourism Marketing Inc joins headteacher Mr Orlando Jones outside Eagle Hall Primary School in Black Rock, St Michael, Barbados as it becomes the first school to join the Barbados 50 Education and Outreach Programme. The programme will link school children in Barbados with classes in countries along the route of the Barbados 50 sailing odyssey leaving London in July 2016 and arriving in Bridgetown for the celebrations on November 30th. 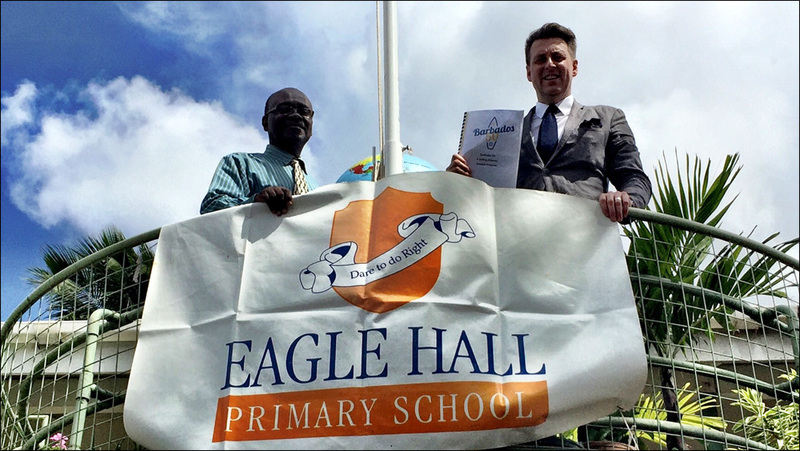 Mr Jones said “I am proud for Eagle Hall to be part of this exciting and innovative project using new technology and sailing traditions for Barbados to reach out to the world in its 50th year“.